“The title of the Conservative party manifesto is ‘Forward, Together’, presumably because ‘Backward, Apart’ isn’t much of a vote catcher.” Anyone casting a dispassionate eye on “British” politics over the past year might agree with Terry Eagleton that this indeed is both the direction and condition of travel Theresa May has chosen for Britain, or England at least. The Prime Minister’s hostility to Scottish independence is well known. It is the traditional high-Tory attitude to post-colonial self-determination – unless the colony happens to be a former possession with few exploitable resources. This encourages her to spout self-contradictory clap-trap whenever the SNP is mentioned. Like Thatcher before her, to whom she is often compared, she does not “get” Scotland. Argument has long since given way to threat: we must do as we are told, or else. Jeremy Corbyn’s London-centric 1970’s trendy Marxist-lite mantra of “internationalism”, which will gladly support self-determination for every nascent nation under the Sun except Scotland, is more problematic for supporters of Scottish independence. The fact that such weird political exceptionalism is killing his party north of the border is a memo that does not seem to have crossed his desk – yet. When it does it may be too later for Scottish democracy. Corbyn may be correct in his analysis of the effect of British foreign policy, but he is way off the mark on Scotland. So, the direction of political travel since the EU referendum is “backwards apart for the many not the few”, into some vaguely defined post-Brexit corporate capitalist state that may or may not have trade links with somewhere or other sometime soon, or not. All this in the name of “democracy”. The Lib Dem manifesto is “Change Britain’s Future”, a typically meaningless phrase (from a meaningless party? ): you cannot “change” the future, because it doesn’t exist. What you can do is change the present to influence the future. The Lib Dems don’t seem to know how to do that. What good is that for Scotland? All party manifestos are myths, stories by unknown authors. But myths are not necessarily contrary to reason. Ruth Davidson may like to think of herself as Aphrodite, immaculately conceived by the Conservative and Union Titans, emerging from the sea of nationalism (Scottish, bad) to spread the love and light of patriotism (British, good) across the land, but she is more like Narcissus, that trans-sexual conundrum from Ovid’s Metamorphosis. We modern mortals perceive her through the prism of the BBC and other television news media trained on Scotland: they see the desirable demi-god (Ruth D.) But unfortunately, the pool our Narcissus stares into shows only Ruth’s reflection, which Narcissus falls in love with. Meanwhile Kezia Dugdale is the ever-talking wood nymph Echo who, because of her incessant chatter, has been reduced by the gods (the media) to repeat the last words of whatever she just heard. 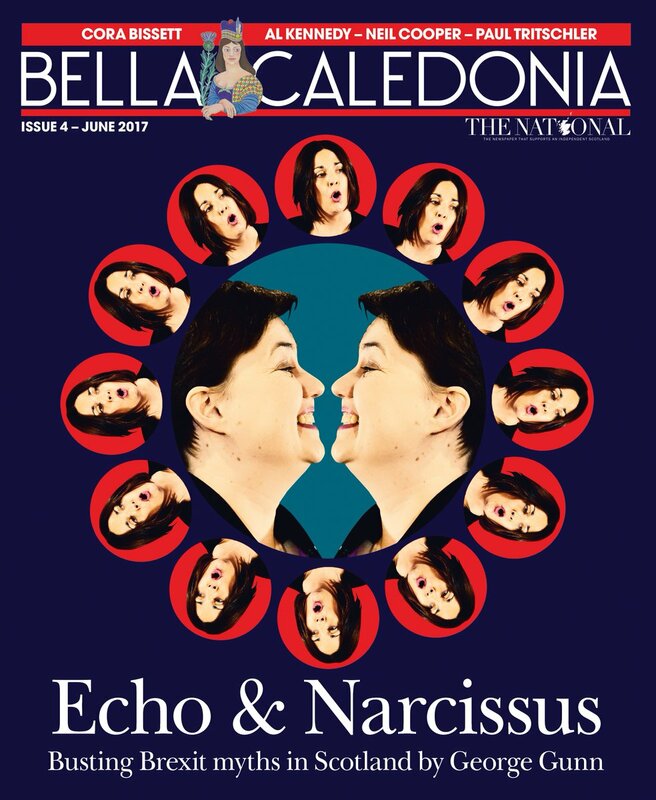 As Kezia Echo looks longingly on Ruth Narcissus, she too has fallen in love with the beautiful image. She approaches Narcissus declaring her undying love and loyalty to the Union, but is angrily rebuffed by Narcissus: Do not touch me! Echo can only reply forlornly: Touch me, touch me… Get away! snarls Narcissus. Away, away… trills the love-struck Echo, retreating to the dark forest of Labour’s position on the constitution where she turns to stone, destined to echo across the media, repeating anything that is said to her. In the end Narcissus realises that the image in the pool is Ruth D. and goes mad, melting like wax into the cold ground of 21st century Scottish political reality. This is a strange and terrible story, yet it is one we Scots (as nature’s children) can learn from. Echo and Narcissus learn the hard way. On June 8th, we can prove that we have learned something. Unlike the BBC. The Beeb repeatedly reports on conditions of “division” and “tension” implying these have been generated solely from within Scotland by the 2014 independence referendum. This “myth” is now “truth”. The BBC’s favourite narrative within our political drama is that the Conservatives are “on the rise”. What they consistently ignore is that politics in Scotland is different from England. Even the Tories accept that there are two distinct political cultures in operation: Ruth Davidson says one thing in Edinburgh and Theresa May can say the opposite in London. They do this openly and calculatedly because the Conservatives assume that the majority do not read beneath the headlines or between the lines in the red top tabloids. Another myth is that politicians must always have a singular vision when, in reality, they can hold multiple versions of that “truth”. For example, the recent terrible events in Manchester were sickening, but the reactions of many ordinary people immediately after the explosion were heroic examples of empathy in action. The subsequent enactment of a one minute silence at public events such as the recent Scottish Cup final were deeply moving. Conversely who is to say that the Conservative government’s instinct is not to extend this silence to mask debate, truth and context? When governing politicians become the moral arbiter, through a compliant media, of how we can or cannot speculate on the effects and causes of terrorism or the consequences of the Brexit vote, then they also lay a claim on how we frame the question “What kind of democracy should we have?” The answer to that, or so it seems every time Theresa May opens her mouth, is the kind of democracy the Tories deem necessary. It’s interesting that Corbyn started to do better in the polls once the public actually heard him talking to them in the various “debates”. People respond to an honest story, or at least a story from someone who appears to have some integrity and “internal logic” which makes them believable. Theresa May’s “story” can’t make any sense, it’s a chopped-up mess of contradictions, because the person telling it is lying to us. She is more like Narcissus, that trans-sexual conundrum from Ovid’s Metamorphosis.